Overall, my New Zealand experience has been a whirlwind of presentations, interviews and meetings (with one weekend break for R&R at a seaside campout). It’s been a rewarding and satisfying opportunity to share my knowledge and insights, as well as to learn from the many able and dedicated people who have inspired me along the way. The change in climate from Bangkok’s steamy heat to Auckland’s early autumn chill was rather a shock. I did not expect New Zealand weather to be quite so cool. Fortunately, my tropical wardrobe was quickly augmented with woolens borrowed from host and conference organizer Laurence Boomert or purchased from the local Salvation Army thrift shop. While time has not allowed a visit to the south island, my wide ranging visits around the north island give the impression of New Zealand as beautiful and pristine. With a land mass about the same size as Britain but less than one tenth its population and plenty of natural resources, the feeling is one of roominess and abundance. A couple hours after my arrival at the Auckland airport, Laurence put on a ferry boat to Waiheke Island, a half-hour ride across the bay from the city, where I gave an evening presentation at the local theater to a group of about 70 island residents, then stayed the night at the home of the Peter Russell family, a beautiful place with awesome 180 degree views of the sea and nearby islands. My presentation there was called, Community Economic Development: A Comprehensive and Innovative Approach, in which I described the multi-stage regional development program I’ve been advocating for the past few years and which our south India project is trying to implement. The next morning a small group gathered over breakfast at Peter’s house to discuss the possibilities for starting a community currency on the island. It took little more than an hour to reach a common vision and a plan for a currency that would initially be issued as vouchers by a popular local café, then shift over into a credit clearing association anchored by a few trusted issuing members. The expectation is that this first node might be the “seed crystal” that can precipitate the organization of similar small clearing associations that will eventually be linked up to form an Auckland area exchange network. Returning to Auckland later that morning, Laurence hurried me over to the studios of New Zealand National Radio to record an interview with Kim Hill to be aired on her popular Saturday morning program. [That program was aired on April 11. During the following week I heard favorable comments from many people who had heard that broadcast]. That same evening, (Wednesday, April 8), a group of about 90 people gathered at Auckland University to hear my presentation on, Money, Power, Democracy, and War: Finding the path toward global peace, harmony, and prosperity. This was an updated version of a presentation I first gave in Tucson a couple years ago. Waitakere is one of five cities (boroughs?) that comprise the Auckland metropolitan region. It seems that the new right-wing national government is determined to replace these five city administrations with a single “super city” administration, a move which will further disempower people and local communities. It is opposed by the majority of residents and likely to face serious citizen opposition. For now, the separate city governments are still functioning. Around noontime on the next day (Thursday), Laurence and I met with some staff people of the Waitakere city to discuss community economic development strategies. The weekend provided an opportunity for some relaxation. The Prana retreat is located on the Coromandel peninsula on the east coast of the north island, about a four hour drive from Auckland. Although the weather was too cold for me to be interested in swimming in the sea, I enjoyed the occasional sunshine, the beach and spectacular views, the peaceful setting , the morning yoga classes, the music, the drumming and the people. Taupo is known for its beautiful large fresh water lake and its hot springs. That was our next stop on the way to Wellington. On the way we stopped at a roadside stand to buy some avocados, which at $5 a dozen ($3 US), were an irresistible bargain. As a second thought I also picked up a bag of golden kiwis for $2. The golden variety, which I had never seen before, proved to be a delicious treat with flesh that is more delicately flavored and less acidic than the common green variety. The present disorder in the financial markets and the cascading failures of financial institutions come as no surprise. Those who recognize the impossibility of perpetual exponential growth and who understand how compound interest is built into the global system of money and banking expect the continuation of periodic “bubbles” and “busts,” each of increasing amplitude, until the systems shakes itself apart. As I’ve said before, and as I argue forcefully in my new book (which I’m told has just come off the press), the separation of money and state is something that is urgently needed if any dignified form of civilization is to survive the deepening multi-dimensional global crisis. The national Community Currencies Conference (April 17-19) brought together well over 100 enthusiastic participants who convened at the Quaker Settlement in Wanganui to share information and discuss new possibilities. My Keynote presentation delivered on Saturday morning (April 18) was titled, Reclaiming The Credit Commons: The Key to Sustainability and Relocalization. Prefaced with a brief outline of my vision of societal metamorphosis, I argued that liberating the exchange process from monopoly control by means of localization and popularization of credit is a necessary prerequisite to achieving a steady-state economy and the devolution of power to local communities. On Monday, the day before my departure for Australia, Laurence took a few of us on a tour of the Environmental Center and a couple community gardens around Wanganui. Towards the end of our tour he received a call from Merania, a reporter who writes for the local daily newspaper. She wanted to do an interview for a feature story, so we hurried back to the Environmental Center to meet her there. She spent quite a bit of time asking questions not only of me but also of Helen Dew and Margaret Jefferies, conference presenters who were in our party. Merania called back later in the evening to say that the editors had liked the story so much that it would be a front page feature in the next morning’s edition. Before leaving for the airport the next day, Laurence went out to fetch some copies of the paper. There it was, complete with photo of me with Helen holding a copy of my previous book, Money. The headline read, How the recession could improve your life and was capped with the tag, Finance guru’s claim. Gosh, there’s nothing like a bit of praise to make one feel humble. P.S. Back to the USA on April 27. Sorry the NZ photos won’t get posted for a while. Feel free to distribute this report. 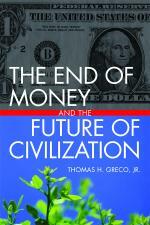 My latest book, “The End of Money and the Future of Civilization” from Chelsea Green Publishers is now in print.